When it comes to digital marketing, almost everyone is concerned about two things: social media and SEO. Both of them are reliable sources when it comes gaining traction, more so if you’re skilled at acquiring new users at a low cost. With that being a said, a majority of digital marketers find it difficult to make them work hand-in-hand to get the maximum results out of it. Once you break it down to the basics, both search engine optimization and social media have very similar skeleton that can be used to bounce off each other’s pros. And with the help of a little bit of learning on how those two work together, you will be able to gain a huge amount of traffic in less time. 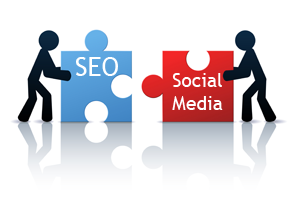 Let’s see the link between social media and search engine optimization. The major connection between social media and search engine optimization is that both are being utilized as a tool to gain more traffic to pages that will boost your metrics. Based on a survey done by Hubspot, 61% of marketers had revealed that improving their SEO and organic presence is considered a top priority, and the best place to do this is social media. More so, when you consider the fact that more than 87% of internet users are engaged in some other form of social networking, according to pew research. This is your ultimate trump card with an exception of organic search. To start off, start by changing the content of blog posts and pages you want to rank into digestible and easily shareable tidbits. Next, create a schedule of when you’ll be sharing on your social networks, and find the ones that work the best for you based on analysis. Once you’ve established a schedule for posting, try to keep this strategy as consistent as possible. This is the single most important point in which most marketers fail. If you are trying the same things over and over again and expect an increase in traffic, then it won’t happen. Be consistent with your frequency, but be creative with the content that you are sharing. As you start to understand which of your strategies are working and which of them aren’t, it’s time to start testing them out out in things like Facebook advertising and promoted posts on Instagram. Paid promotions are an excellent tool to try every now and then, more so when you consider the fact that you can gain more metrics for your paid campaigns and tweak them better. When you keep your call-to-action consistent, then you can gauge metrics with a lot more reliability. I hope this article was useful for you to learn about the connection between social media and search engine optimization. If you have any doubts with regards to this, let us know through the comments and we will be glad to help you out. If you have any suggestions regarding how we can improve the article, let us know them through the comments as well for us to improve. What are the strategies that you have used in your campaigns? What do you think about the importance of social signals in search engine rankings?